Sunday: Washington at Washington State, 5:30 p.m. The Washington State point guard’s eyes light up as he successfully writhes his way through the opponent’s haphazard defense. The look on his face as he flies to the rim unimpeded is one of determination masking utter delight at the sure score. One beat later and the expression has changed to abject horror as a descending Iroegbu realizes that after getting past the hard part of creating an open shot at the rim, the final step has gone awry and the basket has been missed. On top of that, he knows he has surely drawn the ire of coach Ernie Kent, who is trying to turn those transition buckets into the staple of his program. “Basically, if it’s a 1-on-2 on my end, I better make it or get fouled if I’m going to shoot it,” Iroegbu said. Kent came to WSU with the idea of making it a running team and has been successful at speeding up the Cougars. According to Ken Pomeroy’s metrics, the Cougars rank No. 27 in adjusted tempo, up from No. 336 last season, and Iroegbu has been WSU’s pace-setter. Hoop-Math.com defines a transition basket as any that comes in the first 10 seconds of a possession following a steal, defensive rebound or opponent basket. 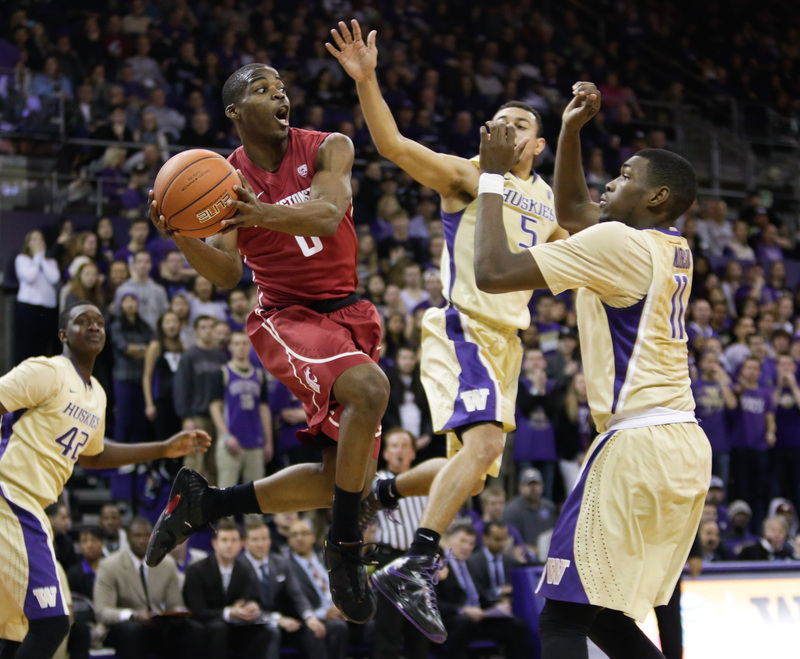 Its figures do not include WSU’s games against Gonzaga, in which Iroegbu made 3 of 4 two-point attempts. The sophomore guard is clearly WSU’s primary threat to attack the basket on fast breaks. He leads the Cougars with 35 such shots at the rim, 15 more than DaVonte Lacy, who is No. 2 on the team. Iroegbu has made 22 of those transition attempts at the rim, a 63 percent clip, a solid figure but one that could be better, especially since the Cougars need him to be a threat on drives to the basket to set up the rest of their transition game. The Cougars stress defenses during fast breaks by forcing them to overcommit to defending one area. When WSU collects a defensive rebound, its wings sprint hard to spots outside the 3-point line, rarely getting the ball but forcing defenders to leave the paint to maintain contact. The point guard, often Iroegbu, receives runs to a sideline and receivers an outlet pass as close to half-court as possible without incurring the danger of a stolen pass. Iroegbu brings the ball up a sideline and either attacks the basket if the defense hasn’t stopped him or kicks it to one of the wings, either way drawing defenders out of the middle for the trailing rebounder. The trailer is probably Josh Hawkinson, who leads the Pac-12 with 8.7 defensive rebounds per game. Hawkinson has been effective as the trailing player, making 11 of 21 two-point jump shots in transition. But for all that to work, Iroegbu has to be a threat to score at the rim. That’s an area in which he has struggled lately, making just 1 of 6 transition shot attempts at the rim over the last two weeks. His recent struggles have dragged down his shooting percentage in those situations, which was 72 percent entering that stretch. One reason for Iroegbu’s recent struggles is that teams are packing more players in the paint to defend against his drives. In that sense, the strategy of WSU’s transition game is working, although if that is the case then he should be passing in many of the situations in which he is shooting. But where that falls down, and why teams are likely able to devote extra players to defending Iroegbu’s drives, is that WSU’s wings are doing a horrible job of punishing teams for leaving them open on the perimeter. The Cougars are shooting just 26.5 percent on transition 3-pointers, a big reason why the team is 307th among all Division I teams in effective field-goal percentage on transition baskets. Although Iroegbu’s shots at the rim are harder than they used to be, and aren’t falling like they were earlier in the season, they may still be WSU’s best option in transition. With senior scorers such as Lacy and Dexter Kernich-Drew about to graduate, Iroegbu’s offensive role is going to get bigger. Since he has the physical tools to get shots at the rim despite multiple defenders, it only makes sense to let him learn how. Published: Feb. 19, 2015, 7:58 p.m.